How To Fire-Roast Whole Eggplant is a venerated multi-cultural culinary technique for making smoked eggplant. Cook whole raw eggplant over an open gas flame, or burning charcoal briquettes or wood chips, or nestled in hot embers. Choose large, firm eggplant with a bulbous base, with stem attached, and with glossy dark purple to almost black-colored skin. Italian Purple, Barbarella, Black Beauty, Galine, and Israeli are all typical purple varieties sold in stores and markets. With a multitude of eggplant varieties to choose from whether round or long, white, striped, or green, large or small, experiment. Reduce the cooking time based on size. It is done when the eggplant collapses, indicating the flesh is cooked and soft, with skin charred black or even showing white ash. 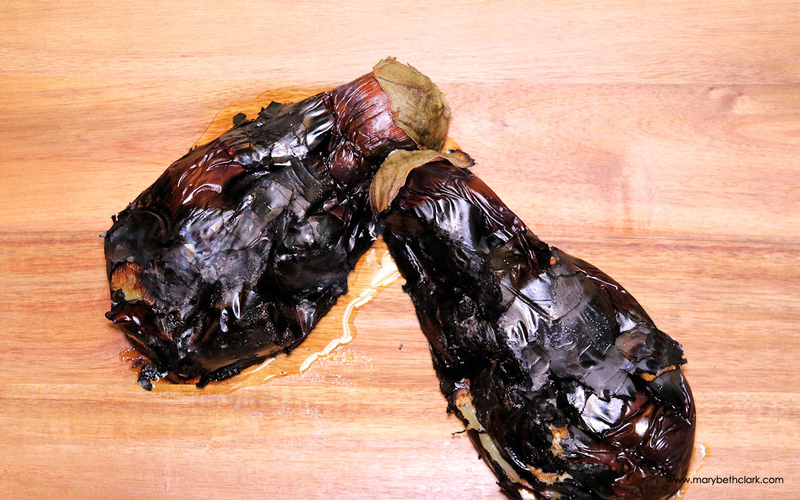 Fire-roasted whole eggplant tastes sweet and smoky and has a silky, creamy texture. It is not bitter, but mature seeds can cause bitterness. Unlike frying or sauteing eggplant, which can soak up oil like a sponge, a great benefit of fire-roasting eggplant is cooking it without one drop of oil, unless you add it as a garnish. 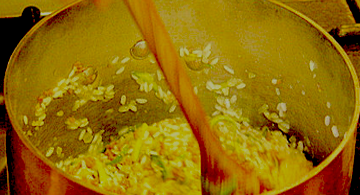 Once drained and peeled, serve it the same day for optimum flavor. Include it in your favorite recipes for soft, cooked eggplant dishes, such as that popular Levatine mezze, Baba Ghanoush or Abagannuc, Hummus, and Eggplant Caviar. Adding to cooked vegetable salads, pasta sauces, casseroles, soups, and stews, smoky eggplant makes your dish stellar. Enjoy! 4 servings. Yield: 3 cups chopped pulp. Cooking time is usually 12 to 15 minutes for large purple eggplants, or up to 20 minutes over open flame or burning coals or wood chips. Other varieties may cook faster than the rotund, pear-shaped purple eggplant. Cooking and Charring the Skin: To fire-roast whole eggplant requires direct contact with flames, briquets, wood, or embers. It cooks the eggplant throughout, creating smoky flavor, and charring the eggplant skin. (Merely blistering then charring the skin without cooking the flesh is not the same.) Cook above an open flame by placing the whole eggplant directly on the gas stove/range grate or barbeque rack above hot charcoal or wood briquets or embers. If fire-roasting indoors, you might want to unplug the smoke alarm before cooking. If direct flame is unavailable, then an adequate substitute is placing whole eggplant on a very hot grill pan, not oiled, although smoky flavor will be mild. Using a broiler or blow torch is not the same, because it is too quick to blister the skin. The eggplant needs to heat up and cook while the skin blisters and chars creating the smoky flavor. Broilers and blow torches do just the reverse, cook the skin first then the interior; often the desired smoky flavor is not achieved. Direct Contact with Flame: Gas Stove/Range: For easiest clean-up, line the drip pan beneath the grate with foil because the eggplant drips during fire-roasting and juices can burn. Over medium flame, fire-roasting whole eggplant usually takes 12 to 15 minutes for large purple eggplant. Other varieties may cook faster than the rotund, pear-shaped purple eggplant. Using tongs, rotate the eggplant a quarter turn every few minutes. Visual Guidelines: Watch and you will see the skin turn dark brown in patches then pull away from the flesh. 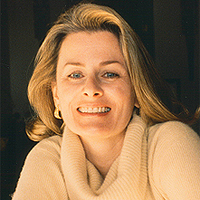 The skin splits, curls, darkens, becomes brittle. At 10 minutes the eggplant is collapsing, quite blistered, dark purple skin curling off in brittle sheaves. Continue, making sure all of the eggplant comes in contact with the flame. At 15 minutes, the eggplant is cooked all over, even its stem part, and it has collapsed. Cooling: Cool down the eggplants for 1 to 2 hours by placing on racks on plates to contain the juice that drips from the pulp. Fire-roasted eggplant can release up to 1/2 cup (118 ml) juice or more, as you see in the photo above. Reserve the juice for another use or discard. 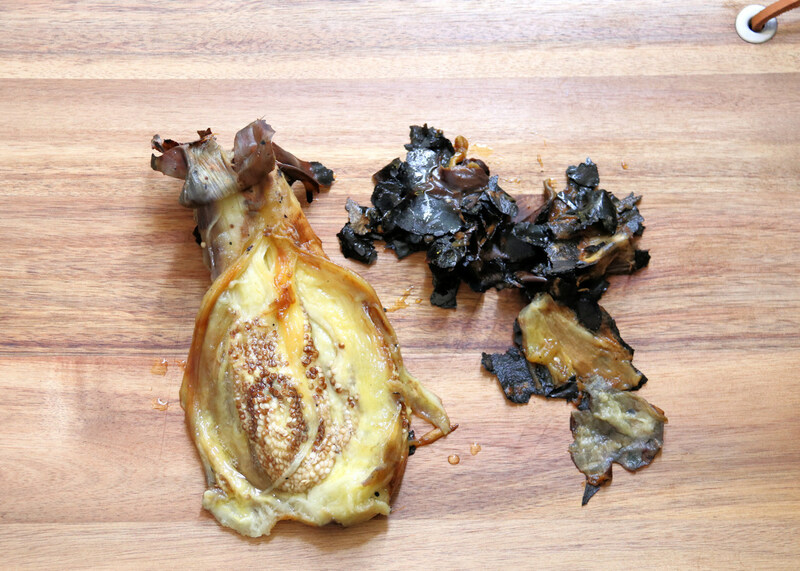 Removing Charred Skin and Soft Edible Seeds: It is easy removing charred eggplant skin. Simply peel it back on itself. For tiny bits of charred skin sticking to the pulp, either leave on or simply use a paper towel and gently wipe the surface, in one direction, from the stem down to the bottom. This removes most of the tiny bits. Use the charred skin for compost for your garden. Continue to rest the pulp on paper towels to absorb liquid, after the charred skin is removed. Fire-roasted eggplant loses about 1/2 cup (118 ml volume) charred skin. 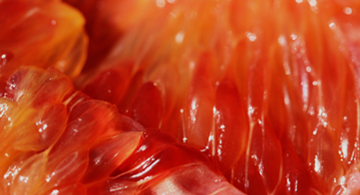 If the edible, soft seeds are removed, up to 3/4 cup (177 ml volume) is lost because they are attached to pulp. After fire-roasting, draining, and peeling, one 1.5-pound (680-g) eggplant yields 1 1/2 cups (355 ml volume) pulp. 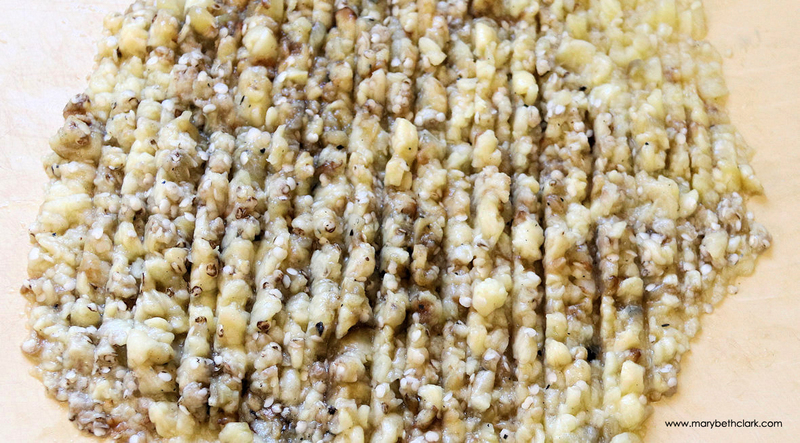 Once peeled, fire-roasted eggplant pulp remains creamy-colored and does not turn brown or oxidize, as raw flesh does when the fruit is cut open. Chop or puree. For best aroma and taste, serve the same day as fire-roasted.